When I checked the apps section for updates in iTunes on Sunday morning, I was pleased to see that the excellent (and free) app for the Gagosian Galleries was listed for one of its quarterly revisions. There were two reasons for my contentment: these regular updates provide some interesting new material that users like me would not otherwise be able to access easily; and I could resurrect the original review of this app which became unavailable when my other website died. Back in June I praised an app called Ampersands by writing that it was useless; but I qualified this immediately by making the point that, to an extent, all Art is useless: we cannot do or make anything with it. I was pleased to see that the developers took that comment in the spirit it was intended. Art does play a part in our lives and the world would be worse off without it. It does seem to me that the iPad is a useful medium on which to display artistic output; and Ampersands was an example of an idea that would be too risky to put out as a book, yet worked beautifully on the iPad. While a special issue of a book might reach hundreds at best, the iOS app has the potential to be seen (if not downloaded) by thousands, so adding a page about the source or a link, may bring an increase in visitors that may not otherwise have been possible. In many major centres of population are sections where certain trades or skills gather. The same is due for Art, with Paris, London, New York, Venice and other cities, each with their own areas where it is not uncommon to find galleries. The gallery is like a bridge between artist, collector and the public. Because artists create and collectors buy, the middleman gallery is available for us to view works before the artists become famous or dead (or both) and their works not in private hands end up in museums. The last time I was in London, for example, I was able to visit a gallery in the Bond Street area and view some of the recent works of David Hockney. 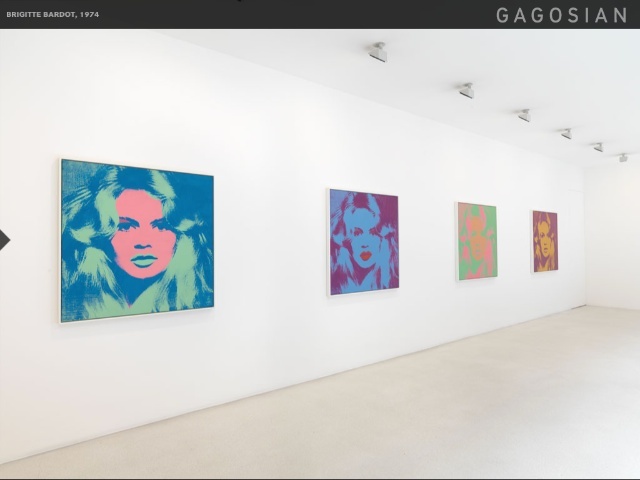 In London and several other cities, is the Gagosian Gallery: an art gallery chain. They display and sell modern Art. They have also produced a fine app that introduces and displays selections from the works of a number of artists. 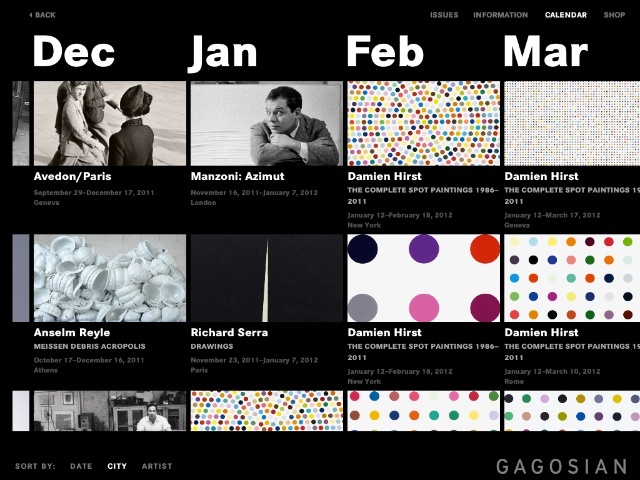 For some reason the first time I downloaded the Gagosian Gallery app it took an unusually long time to download. However, as this was a download of 616MB that may have been part of the problem: a lot of data, I thought. The app also took a long time to install, but I noticed the Apps panel for the iPad was reporting 0.20G over capacity. I began to hunt round for items to delete. For some of us, it may be necessary to cull unused apps, podcasts, videos or photos. The same happened with the download of the 3rd quarterly edition of the app. Although the app update itself was downloaded and installed with no problem, when I opened the app, after the Damien Hirst Spots screen (see comments below), I saw in the index that the three issues were shown: Issues One and Three ready for download; Issue Two already available. Of course I wanted the latest issue (3) and pressed the download button. Not enough room, I was warned. As with the first time I had installed this, I went on a serious unwanted-apps hunt, but even after trashing almost 30 there was still not enough space. This is an early warning for iPad users. As we download more apps that have content updates, so the limited space on our devices will fill more quickly. I had toyed with the idea of a 64GB iPad2 when the devices arrived and wished I had bought this; but then I would have become even more complacent and it would have filled up just the same. I found large amounts of data by looking lower down on the apps panel when the iPad was connected to iTunes. There is a section there that allows synchronisation of data from the Mac to the iPad. I cleaned this out almost totally. The app uses multimedia in several ways: as well as generous displays of the images there are occasional video comments on artists and a QuickTime 360 degree display of one of the Gagosian shops. Like Ampersands the display structure is similar to magazine apps such as NewYorker. This means it is easy to navigate, but there is more than one way to arrive at the same page so it may be used as a direct route to a specific artist's work or as a browsing app -- which is what I did when I first installed it -- just to enjoy the excellence of the content. As a hint to anyone downloading this, press the name Gagosian in the bottom right corner: each time a different display appears. I am not an Art critic, nor do I play one, etc.. . . . Art is to a great extent, subjective. I like what I like. Although I had seen prints of the image before, when I first saw Picasso's "Old Man with Guitar" in the Art Institute of Chicago, it sent shivers down my spine. There is a selection of Picasso works with a specific theme featured in the Gagosian app Issue 1. Also in Chicago, I saw Jackson Pollock's, Cathedral, a work of art that does not suit some tastes. While Pollock was not featured in the App then, a young British artist, Cecily Brown, produced works which in my mind are similar to Pollock's, with a hint of the earlier Kandinsky. Bold and bright, these need huge white walls to display them to their best. A gallery exists to sell. The link to the online shop, first shows a 360-degree view of the Madison Avenue store (New York). The store display in the first edition of the app offered books, posters, publications, t-shirts (if you need to ask how much, you cannot afford one) and even a sculpture for $45,000. I mentioned earlier the Damien Hirst opening screen. 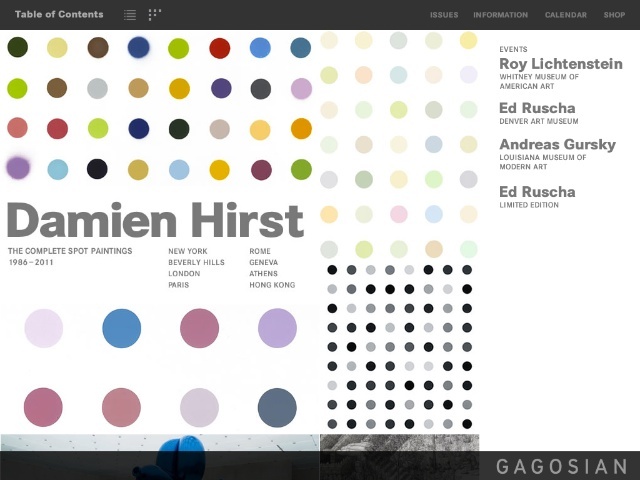 I was intrigued to see this as Hirst and the works -- 331 of them -- had been criticised in some quarters last week (Kia Makarechi, Huffington Post), so having access on the iPad was a pleasant surprise, especially when I found how the app makes good use of the iPad features. The pinch allows the spots to be made really small with a display of 24 x 32 (768), or large, with just one spot filling the screen. As I watched, the colour changed. Initially I thought this was time controlled, but the colours seem to be adjusted by the motion of the iPad: different aspects, different positions, produce different colour sequences. As this was just the opening screen, I was enjoying this. As well as the concept being used for the opening screen, the complete Spot paintings are just the first item in the contents of Issue 3. These are in 15 sections shown after a text introduction. Pressing one of the spots (e.g. Antibiotics, Sedatives, Pheromones) opens a panel with several different viewing options, including some interactive displays, paintings, photographs and text. Once or twice I had trouble navigating out of these pages. Maybe I wasn't meant to. Restarting the app, gave me a different sequence of displays. Ten other artists are featured in Issue 3: Howard Hodgkin, Mike Kelley, Jeff Koons, Roy Lichtenstein, Paul Noble, Richard Prince, Jenny Saville and Richard Serra and Zeng Fanzhi. Andy Warhol is shown with the series on Brigitte Bardot and another on Liz: the late Elizabeth Taylor. As well as paintings, sculptures are represented by Jeff Koons with pictures of 13 of his balloon creations. Many of these are shown in several different photographs. Hanging Heart for example was displayed in three separate colours at 6 locations, while the beautiful Diamond (Blue/Gold) was only shown one time. Gagosian also presented the work of Richard Prince which was installed in a private house in Los Angeles. The 13 photographs and 5 minute video of the installation (including a bedroom I would die for) transform the house itself into a work of Art. Video is used to good effect in the walk through of the massive display of Richard Serra's two prices: Junction and Cycle. These entries include text and photograph backgrounds, the video walkthrough and a 360 degree panorama video for each of the works. Apart from the featured artists and works, other controls allow the user to examine the 3 issues and open or download (depending on space). The Information menu links to entries on Galleries, Artists (an A - Z of the artists linked to Gagosian), News + Events, Credits and Help. A Calendar, which may be sorted by Date, City or Artist took a while to load (or download), but gives a comprehensive look at past and upcoming events. Clicking on any of the entries brings up a panel on the event. 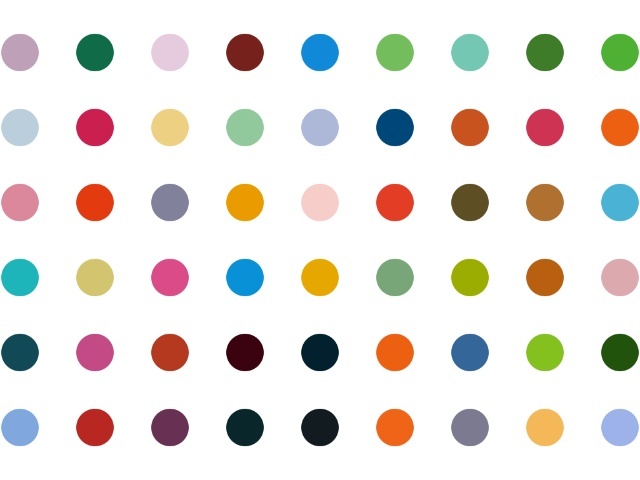 For the immediate future Damien Hirst dominates. 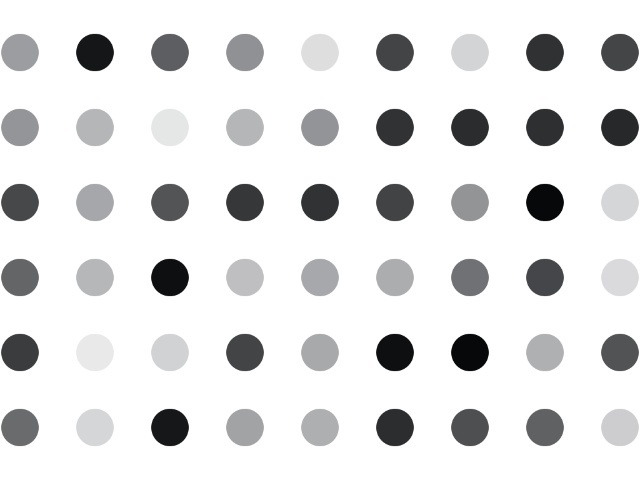 Indeed as I was writing this, an email from s[edition] -- an online gallery for digital art -- sent me information about Hirst's Spots (I could buy a digital version for $7.50). 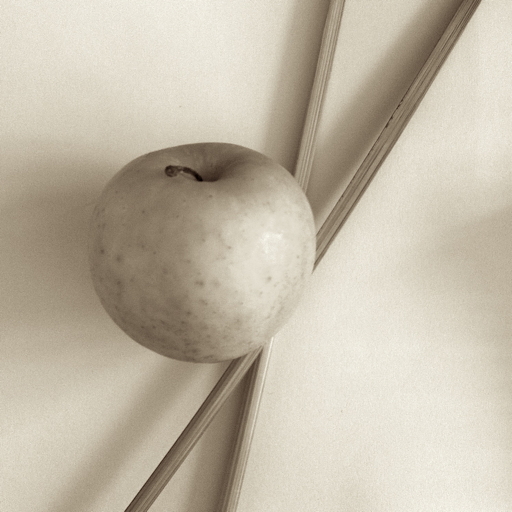 As ever the last menu in the Gagosian Gallery App is the link to the shop. The panel opens with its 360 deg image. Tapping on the tab to the side brings up the purchases section, unsurprisingly the Spots featured with clocks ($470/$750), bags, t-shirts, cuff-links, keychains, mugs ($25) and other like merchandise. There is much more than just the Hirst items, currently flavour of the month, and the online catalogue has grown considerably in the last few months: somewhat unique gifts for sure. The beauty of a gallery and the gallery app is that we can look and enjoy the experience in itself. One of the beauties of Art is that it appears to be useless but stirs and makes us ask questions. The Gagosian Gallery app allows those of us in areas of the world a limited access to many fine modern works at the touch of an iPad screen.